Screenshots for the original Galaxy In Turmoil mod even sported the Star Wars logo. Mod team turned development studio Frontwire Games been making a lot of noise over its free fan recreation of the cancelled Star Wars: Battlefront 3. Turns out Lucasfilm is fine with them making the game, as long as there’s no Star Wars in it. Back in June, Frontwire announced its fan-crafted version of the cancelled Star Wars: Battlefront 3 would be getting a Steam release. In a letter to the community, Frontwire president Tony Romanelli laid out what went down between the studio and Lucasfilm since June’s high profile Galaxy in Turmoil announcement. On Wednesday June 22, 2016, we received a letter from Lucasfilm requesting that we halt production of Galaxy in Turmoil with any Star Wars related IP at once. Rather than laying down at the first sign of trouble, I requested a meeting with the Lucasfilm executives to discuss our project and to find some common ground to work with. Honestly, I didn’t expect too much negotiation to occur. But much to my surprise, executives at the top of Lucasfilm agreed to meet. A week later, that meeting took place. I will give this to Romanelli—asking for a meeting took guts. And kudos to the Lucasfilm executives who met with him by phone to tell him there was no way the project could continue while using Star Wars assets, the Star Wars name or vague glances in Star Wars’ direction. Lucasfilm had spoken with EA, the license holder for the actual Battlefront series, and the publisher had no desire to see the project continue, either in fan project form or under EA’s publishing wing. Bad news for folks looking forward to the Star Wars-themed online multiplayer game, but those open to less litigious science fiction will find comfort in the knowledge that Galaxy in Turmoil (affectionately known as GIT) will continue development as an original science fiction IP. The game will still be released for free, though players will be free to donate once the game is in a playable state. They’ve got a new website and everything. It’s very nice. It really was only a matter of time before Lucasfilm stepped in. 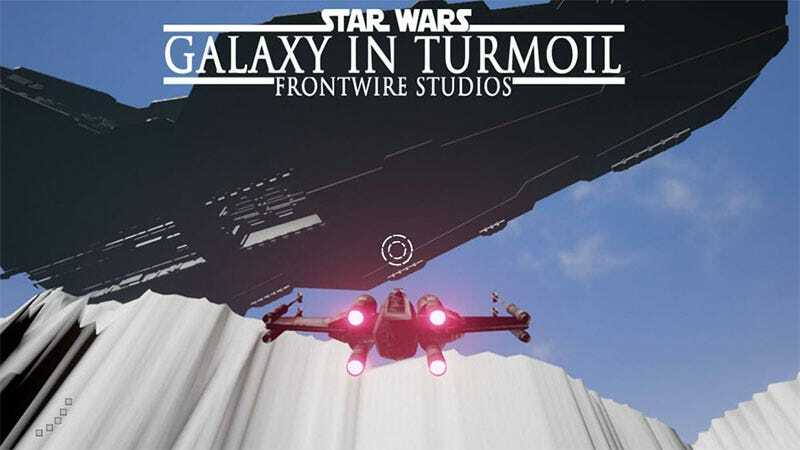 Galaxy in Turmoil began as a mod that liberally used the Star Wars name and property, aimed at making up for what many fans felt was the tragic cancellation of the third entry in the original Battlefront series. Frontwire is now a development studio actively working on other games alongside Galaxy in Turmoil. Even though the original version of the game would have been free and Frontwire had established a separate business entity to work on non Star Wars projects, the studio would still see substantial benefits from name recognition alone. And while Galaxy in Turmoil can no longer use the Star Wars name or assets, they still come out of the situation with a large community invested in their original science fiction shooter. While I and our attorneys still believe that we fall under the Fair Use law, I have no desire to get into any type of legal battle with Lucasfilm, and lose due to the sheer amount of money Lucasfilm has. As a businessman, I have enough respect for other companies and their intellectual properties to not put up a fight that should not be fought in the first place. At the end of the day Star Wars is Lucasfilm’s property, and they have every right to request Frontwire stop using their IP, even if we believe that we were within legal limits.